CAPE CANAVERAL, FL � April 26, 2007 � Zero Gravity Corporation (ZERO-G�), and its sponsors, Space Florida and The Sharper Image, successfully flew world-renowned physicist, cosmologist, and best-selling author Professor Stephen Hawking into weightlessness today, performing eight parabolas, out of the Kennedy Space Center today. It was the first time Professor Hawking, the world's leading expert on gravity, had an opportunity to experience zero gravity. The ZERO-G Experience� fight with Professor Hawking took off from the Shuttle Landing Facility at the Kennedy Space Center in Central Florida. "It was amazing. 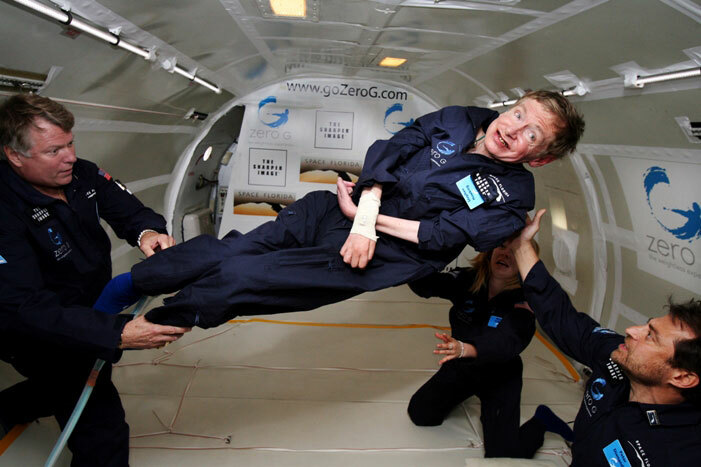 The zero-g part was wonderful," said Professor Stephen Hawking. "I could have gone on and on � space here I come!" Ted Straight, an 8th grader at Stone Middle School in Melbourne, FL of similar height, weight and build as Professor Hawking, had the prestigious honor of serving as Hawking's stand-in, or body-double, on yesterday's training flight. Susan Harris, a teacher at Hill-Gustat Middle School in Highlands County, FL, participated in both the training flight and the flight with Professor Hawking, during which she served as a flight coach. Harris is recording and sharing her experience on the Hawking flight via a blog on the ZERO-G site � http://www.GoZeroG.com. The ZERO-G Experience consists of a brief training session for flyers (ZERO-G passengers) followed by a 90-minute flight aboard G-FORCE ONE, during which parabolic maneuvers are performed. The controlled ascent and descent of the plane allows flyers to experience gravity on Mars (1/3-gravity); the moon (1/6-gravity); and in zero-g space. Since launching its service to the general public in September 2004, the company has conducted more than 100 weightless flights and flown more than 2,500 passengers, including celebrities and personalities, corporate charters, science and math teachers, and individuals age 12 to 85. G-FORCE ONE is a specially-modified, 35-passenger Boeing 727-200, and The ZERO-G Experience� is the only FAA-approved weightless flight experience available to the general public. The weightless flights are similar to those conducted by NASA for more than 40 years to train its astronauts. ZERO-G was recently granted FAA approval to fly individuals with disabilities. ZERO-G operates under the highest safety standards as set by the FAA (Part-121) with its partner Amerijet International. Aircraft operations take place under the same regulations set for commercial passenger airlines. Zero Gravity Corporation (www.GoZeroG.com) is a privately held space entertainment and tourism company whose mission is to make the excitement and adventure of space accessible to the public. ZERO-G is based in Florida and Las Vegas, Nevada, and is the first and only FAA-approved provider of weightless flight to the general public, as well as the entertainment and film industries; corporate and incentive market; non-profit research and education sectors; and government. For more information about ZERO-G, please visit http://www.GoZeroG.com or call (800) ZERO-G-800.